We were very pleased with your prompt and efficient service and the quick responses we received from your recommended suppliers. All were knowledgeable and provided detailed quotes complete with technical information and pay back calculations. We are quite pleased with our chosen supplier, Essential Solar who also provided additional savings by changing our lighting to LED. Dealing with Finn at Solar Quotes was one of the most informative and constructive experiences I have had with anyone in relation to the supply and fitting of a Solar System to our residence. The initial contact, information and quote process was seamless, with three very capable suppliers making contact almost overnight. The Inspections and quote submissions were professional, efficient and extremely helpful in assisting us with making the right decision. After the Quote submissions were received, a few questions came to mind, and Finn from Solar Quotes was more that happy to assist with even the most fundamental issues along with the more complex questions posed to him by myself re the subject. The answers given were direct from a man confident in the process and the related issue, ensuring we had every bit of information we required to make an informed decision. Based on the information and the quotes we went with Green Sky Solar and fitted a 17 panel array with 17 micro inverters. I like to thank Finn and his team for all the kind assistance and for one of the most professional and customer service based quoting services that I have encountered. I would highly recommend Solar Quotes to anyone interested in having Solar fitted to their premisses or business. Thank You for enlightening me in my solar journey! Finn thank you very much for your VERY valuable service. I will be recommending your website to ALL my friends who are in the process of investigating solar installations. Thank you very much indeed for your website .I had been researching solar for some time and the info from your site convinced me to go ahead. The three companies you selected provided quick detailed quotes. Your site really helped me understand what to look at technically. I ordered a 15kw system from Sahara Solar which was installed first week of December (well done Ben!) and is performing to my expectations. Thank You for all your help and your site really does offer and gives the normal Solar Power laymen like myself much appreciated information and advice. I could of never got to this position of making a well informed decision without your help. Using your website gave me so much information that we were able to get quotes but most of all we were able to understand what they were saying. We would like to Thank you and your team for a wonderful , knowledgeable, easy to understand, website. I have always believed that good service should always be mentioned. Society is very quick to complain and whing, but there are a few of us that when we receive good service, actually take the time to tell the company or individual employee, that they have done a wonderful job. As I said Your whole team helped me enormously in not only learning about solar, but the appropriate questions to ask . Your team does not stop there, I feel you all go beyond that and reply, very promptly. About my questions and worries. Thank You team, Keep up the wonderful work. Finn, Thank You!! Your Site is the best! 4KW system installed by Beyond Solar, and I am very happy and have left feedback to say so. So happy you simplified the BS I was getting from the door knockers. Thank You and my wife and I can not speak more highly to our friends about your site. Have just read some of the material on your web site. Had to at least say “thanks” (which is an underestimation of what excellent help the parts that I have read so far have been). It’s pleasing to see that someone with your capability and background has settled in SA, and that you have such a good team. The summary of your path to SA is an inspiring read. The material has substantially addressed or confirmed most of the concerns I have had since considering the 3kW system that has now been operational for several years. It’s also helped me reflect on what I should have done (such as sought out an organisation like yours at the time). However, your material has given me confidence that there are ways forward if given appropriate consideration and finance. Thank you very much for your follow-up and for providing such a great service. I was contacted within two days by all 3 companies who were all able to answer my enquiries. The information on your website and the service that you offer has provided great clarity in an otherwise, very confusing field. I’ll be recommending your website to everyone who is interested – and already my builder wants your details. Your easy to understand explanations for someone totally ignorant about the whole solar issue is just fantastic. Extremely helpful. I have recently become aware of your site. I applaud you all on the quality of the information and service that you are providing to viewers. Many thanks for the quick response. Solar panels is something we have been considering for some time now, but it hasn’t been easy to find out all the relevant information – you have really helped with this. It helps a lot Robert, thank you very much for your insights! This is exactly what I was looking for. Really appreciate your end-to-end approach, know-how that you provide on your site, and follow-up, premium advice like the one below. Magnificent service for someone who had no clue about solar before coming across you guys. Hi Robert, thanks for your reply. I agonised over the contract I had signed and almost changed my mind and went ahead with it anyway. But in the end I confirmed the cancellation! Thank goodness, in light of what you said. Thanks for all your prompt replies and help. A great service you have there! Hi, I think your site is great, thankyou so much! We have been putting off solar for years because of confusion, but I am feeling better after trawling your site. Thank you for your informative, no-BS website. It gave me a grounding in the subject and told me where to go for more detail. Your list of suggested suppliers was great and I was able to pick one who satisfied my requirements, gave me a good price and a professional team of salesmen and installers. Why would anyone go elsewhere? Thank-you Finn for the assistance provided through your web site. I became more educated about many aspects of the often confounding solar industry. Three businesses got in touch with me and provided quotes and followed up with either visits or long telephone conversations. All were thoroughly professional and didn’t use pressure at all. This together with my research and quotes from other providers resulted in a signed contract with one of the companies you recommended. You have a good website and service which cuts through a lot of the market spiel. I’ll be happy to recommend you to others. Congratulations on offering this service, it is much needed as the solar industry can be quite complex and confusing. Thank you very much for your assistance and for the very valuable advice. It is a great website you have and I am very glad I found it. Thanks for the quick response. You guys have been a great help. Much appreciated. I shall be giving feedback once everything is installed. The info on your site is da bomb, you guys are doing an awesome service to the community to have all this info in one place and easy to find! I would like to compliment you on the site and the service you provide. Being a ‘solar’ novice I found the information you provide through your site very informative and in a easy to read, practical format. Being a little skeptical at the best of times I am normally a little reluctant to click on things that make generous promises. Thankfully my scepticism was not founded in this instance. We have actually chosen a system/company and will be going ahead with the install mid Feb.
Again, thank you for having made this process (to this point) a pain free one. All the best with solarQuotes for the years to come. Many thanks Finn for providing an informative, helpful & honest website that may prevent some of us making costly mistakes! I think your website is fantastic and exactly what I needed to start getting my head around the various solar solutions and players. It is an invaluable tool with a wealth of solid knowledge. I am green, green, green all the way especially when it comes to solar. SolarQuotes provided me with information to three good quality installers and removed the confusion and guesswork to what appeared to be a very complex and daunting decision to make. Not only am I now very well informed but was very impressed by the time and energy you took to ensure I understood the information I had received. Thank you SolarQuotes. Your information has been invaluable to me and I am most grateful for your assistance. It has really set my mind at ease. We are looking at building 8 star sustain + able urban town houses. The simplicity of your website and the quicksilver reply addressing our needs is greatly appreciated since we were stuck in this inertia of bad press & info overload! Yes we will be going ahead with Solar Power but it will be next year. Your site was invaluable in getting the correct responses from the real people in the industry. Pricing and actual hardware to be used was obtainable and the basis for a real comparison possible. Door knockers were the catalyst but not the answer, pays to do your homework. I have been reading the information on your website for a while now and I want to thank you and congratulate on your contribution to renewable energy in Australia. Well done! Many thanks for your website, which is a very valuable resource. I’ve already recommended you to others. I’m impressed by your web site and the information it contains. The questions you provide are very useful and the responses will be a big help in my decision about the purchase of a system. Your checklist is really useful! I’m sure lots of people appreciate what you are doing in this really important area. Thank you for your offer of availability if I have need of further information. Finn, you are a godsend. I don’t know what I would have done without your site. It was absolutely essential in terms of learning the “language” of solar before talking to suppliers. All three suppliers contacted me within 48 hours, and quotes came through very promptly. All boxes ticked, and prices acceptable, and now my problem is finally deciding on the best hardware. Can I first say a huge thanks. Your website has been invaluable and I think I’ve been responsible for most of its hits this weekend. It gave me enough knowledge to deal with 3 different companies, and pick a winner. Once again I would just like to thank you Finn and your crew, for putting out such a great and informative web site ” it helped me out no end”. If I hear anyone mention anything about “Solar” your web site will definitely be mentioned, and all the best for the future. Just wanted to thank you again for your time and knowledge this morning in regards to solar. Much appreciated awesome customer service!!!!!!! Once again thank you for your prompt response and reassuring advice. Your website is an absolute gem. Being independent provides customers with confidence as salesmen obviously favour their own product. With your help, our system should be on the roof in 4 weeks. Just wanted to say also how your website is an absolute wealth of information, and an absolute life saver to us plebs. First of all sorry for any mistakes in my message as English is my second language but I want to give you a huge thank you for making & maintaining your website as it is “the best of the best” when it comes to people who have no idea about solar systems to get information and reference guides for it, with the ease of understanding for people like I am (none English background). I have to say that your website is excellent in this area but it is little bit hard to navigate from your home page to the point were the user may need to go, it is much easier for the user to type in the question on Google search and then to click on your link popping up to get to the desired place. It was companies that have tried to say that my trust in your website is incorrect and that you are only a media person who has no knowledge in this field etc…. I did not pay any attention to them as I am an IT, telecommunication & network technician and have done my research extensively from other sources also to come to a conclusion that your website information is 100% correct and the best in the world when it comes to solar systems parts, installers, types, reviews etc…. I am not a person who is just after cheapest quote for anything, I always want very high quality for the most reasonable price and I am shore I got it with your website help, your recommended installer was not the cheapest but I must say that they were excellent in dealing with, most professional, reasonable priced and they are between the first 5 installers on your website with hundreds of positive reviews which was one of the main factors in my final decision. Also just to let you know that we think your website is a fantastic resource! A huge help to us and my Dad just loves your site and has spent hours reading all your articles! Thank you for putting up a very well written, easy to navigate, supremely informed while clearly understood website. Your site was by far, the best for everything I needed to know about solar for my home. Thanks to you, I have made a well informed decision to go with a 5kW hybrid inverter (of which I had no clue about before reading your site). I was armed with all the right info and asked the right questions when the sales rep came to quote. Thank you very much this is a brilliant service for people who are unsure of what to do and how to do it. Thanks for your great service as I know I would not have come close to a sensible choice without the resources you provide. I have received the three quotes, the service and reply is very good. I also found the no BS spread sheet very useful in reviewing which option is the best. I have forwarded your email on for a couple of colleagues who are also looking into solar power and are a bit lost. Thank you so much for the information. You and the web site have been extremely helpful and I am very grateful. THANKS FOR ALL YOUR HARD WORD AND EXCELLENT EXPLANATIONS. I WENT AHEAD WITH PANELS AND LEDs, YOUR ARTICLES, DIAGRAMS OF PANEL OUTPUT GIVING ME A HANDLE ON WHAT TO DO. HARRY, FNQ PANELS AND LEDs INSTALLED HUGE CUT IN POWER BILL. The process was made much less painful by your excellent site which brings light to where, for most of us, there is dark. I found your website invaluable in its content and impeccable in it’s honesty and impartiality. Furthermore I couldn’t be more satisfied with the company who did the work in my house. A resoundingly positive experience with DKV ELECTRICAL CONTRACTORS. I would like to express my thanks to you and your wonderful website which was used extensively during the process. The information on your site and ease of accessing that info was superb. Without it I don’t think I would have been as well educated as I am now. You obviously are a dedicated man to the solar industry and I commend you on that and the website you have created. I would just like to say thank you so much for your help with the solar quotes! You have all been so helpful and your website is amazing!! I had no idea what I was looking for and just from reading your tips has made me feel like I know everything about solar that I need to know, also providing me with a list of questions to ask the companies was so good! And pretty much got all of them to extend all their warranties and give me a better price then what they originally offered. Also I was so impressed at how quickly you guys would reply to my emails or helped me over the phone and never made me feel dumb when asking basic questions. Honestly can’t thank you enough. Thanks a lot, you guys are a great help. I can’t believe what I have learned in the last few weeks just by trolling your links, correspondence and articles. I have enjoyed reading your site and found it to be the most honest and open plethora of solar information in one place by far. Thanks so much! Your site and information provided below in the email are amazing. I’ve found that going solar isn’t as simple as I thought it would be and requires significant number crunching. Huge thanks to you for the effort you have gone to in order to enable potential ‘solar savers’ to make informed decisions. I think your www is wonderful for people like me who didn’t know a lot about solar. I’m certainly a lot more informed and want to give you a big pat on the back. Thank you for providing this service. Many thanks to you for your prompt reply to my request for information, and may I say what a wonderful service you provide. The process of learning about the various aspects of Solar Technology and seeking out a reliable installation service was quite daunting for me prior to contacting your website. I will follow up with you at the end of this project to give you my summary of my Solar installation experience! Finn’s website is a real treasure trove of information and both he and Robert are a font of knowledge when I asked some further questions. When I embarked on the solar journey, i thought it would be very simple and found there was a lot more detail and variation in panels, inverters, installers, etc than I expected. It was good to know that the three installers had already been screened by Finn and his team. I would recommend (and already have) solar quotes unreservedly. Thank you very much for your website. It has been invaluable to my wife and I in deciding who to go with and what products to install from this very confusing industry. Thanks to you, we now have a very clear idea of where it is we want to end up in a few years. Thank you for your help with this difficult decision! Big thumbs up to you and your site. I’ll be recommending you going forward. Thank you, thank you, thank you. It’s such a relief to get an intelligent, informed, helpful response. Hi Finn – we did get our 3 quotes – we found all 3 responded quickly and all very helpful – all were professional and informative. Very happy with the whole process – our only problem now is which quote to accept. Thank you for this service Finn – it has made something that was confusing to us so much easier to navigate. Fantastic! Just like to say thanks for all the help via both the website and replies to my email questions that you (Finn) and your team gave to me in helping us select our solar PV system. I did, of course, use other online sources to help in our decision making process but SolarQuotes gave the most comprehensive, unbiased and well-presented information. Well done to Finn and the team! Thanks once again for your service to nature and humanity by shining “light” on the wonderful world of solar power. Thanks for an incredibly helpful website. It raises issues I hadn’t thought of and I feel much more confident now in getting quotes and asking the important questions. Finn I would really like to thank-you for your extremely helpful website and your assistance helping us to navigate our way through what is a fairly complicated area. Your website is nothing short of brilliant and I admire your enthusiasm and attention to detail. Found your referral service to be of high quality and your website references invaluable. The addition of the Quote Comparison Checklist is a great tool for “we mere mortals” to pull the quotes together. Your site was extremely helpful, as well as your prompt answer to my emailed questions. Your service made my decision so much easier. You have no idea what a blessing it was that I found your site.The three quotes you refered me to have very high reviews. Please, Please, do not let your standards down by allowing COWBOYS on you website. I have encouraged others to visit your site before they make any rash decisions. The amount of pensioners and working people that have been duped by unscrupulous companies is very sad. I pray that your site remains as beacon for people to view and be guided. God bless you sir, and THANK YOU. 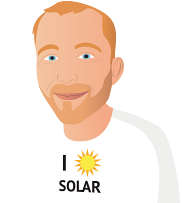 I just wanted to say thank you for your fantastic website: it was so helpful to have some independent advice and technical details under my belt before I spoke to the solar installers themselves. It was also very, very helpful to have the solar installers contact me rather than having to do the ringing around myself. By far the most helpful thing for me, though, was the testimonials of other customers: their comments were what finally led me to Scott from Australian Solar Designs, who was every bit as reliable and trustworthy as the comments said he was. So thank you! Your website offers a great service. We got three quotes very promptly. We have accepted one of the quotes. We were very pleased with all the vendors. We got a range of prices and specifications. Thank you for putting them in touch with us. We found that the transparency of the process worked well. We referred to quotations and system specs in negotiating and spoke with each vendor personally. And our background research, including good material from your site, meant we were well-enough informed to make a decision with confidence. Thank you. You were a great help. Thanks for the followup. We have had quotes from 2 and a phone call from a 3rd to arrange a time to call and inspect. The inquiry originally started after we were called and had a visit from another company. They were quite a hard sell and we wanted to get other advice. The other quotes received from your recommendations have been helpful and we have rejected the original company quote. I found your website, information, service, interest, fantastic, truly very helpfulthanks for doing such a good job. Overall, your advice changed my attitude about solar from ‘nightmare’ to ‘dream’ and I am very grateful to you for this. I would just like to comment on this web site. It is the best and most easily understood explanations of solar power generation that I have read (and I’ve read a few). You present all of the information in bite size chunks easy enough for even a layman like me to understand. To be honest, like all these things we sign up with on the internet, I didn’t expect much from any companies that would make contact. Yet I have been pleasantly surprised by the personalized approach by them. Both companies have called me directly and the people I have spoken to actually seem to work there, not telemarketers. I have 1 quote already which is decently priced, and 1 company who I spoke with the other day (who seems to have much better knowledge) said I would have the quote soon. Thank you for operating a website that seems very real and genuine. I commend you on your site and the mountain of information it provides, it made the decision making and comparing products much easier. I will certainly recommend any friends and family looking for solar to visit your site for info. and request the 3 quotes. Again, thanks for the website, keep up the good work and we look forward to harnessing some of the copious sunshine here in Perth. Thanks for the absolute professionalism and the service and competence of your organization. Happy to oblige to this Testimonial – to express my personal views on such acknowledged business practices, when sincere and justified, gives me pleasure. By the way I think your Solar Quote website is absolutely fantastic. It has everything you could possibly want in order to research solar panels, inverters and installers. Now armed with all this information I have to decide what’s best for me! I “accidentally” came across the SolarQuotes website and visited quite a number of pages just out of interest. I was very impressed both with the content and the tone, and had quite a few chuckles on the way. It is very impressive that you are putting all that information and know-how out there. Some 4 years ago, and without doing the payback calcs, we installed 2 x 2,500W PV Solar systems on our house (the max allowed by our local electrical distributor) just because we thought it was in principle the good / right thing to do for the long term. As time has gone by I couldn’t help but wonder how things have turned out and am glad of having found your website as it provides me with quick start to assess our situation. I congratulate you and your crew for having put together such a wonderful and helpful website and the long list of testimonials appear well deserved. I laud you on your achievements and would like to second the sentiments so elegantly expressed in Jorge Estevao’s testimonial of 16-May-13! I normally don’t do this kind of thing but was so impressed with your website that I felt I just had to congratulate you. I wish you all ongoing success! Thank you very much for your very prompt response to the questions I sent. I really appreciated the links you provided and have checked them all out. Seems some installers may say anything about solar products to promote their own offerings. You really need a science degree to understand all the variations but I must congratulate Finn and his team on the great information they have made available. Certainly assists in the process of understanding and trying to choose appropriate solar components. I got the quotes. Unfortunately I won’t proceed as I don’t use enough electricity to make solar viable but the firms that quoted were very happy to help me work that out and to give honest advice rather than try to sell me a system that wouldn’t be viable. Well done in using honest and honourable suppliers. First of all thank you for the advice your site has. It made learning about the sytems and finding info a hell of a lot easier than I thought I would. Your site is brilliant and helped immensely. I did get the 3 quotes and I got all of them in a timely manner. Sales reps from the companies tend to talk in a fast-paced waffle that puts down any competitor’s products and promotes their own. Through your website I was able to access unbiased reviews, comparisons and information after the sales reps had done their best to confuse me. It proved invaluable in helping me research and make informed decisions that I can be reasonably comfortable with. The large number of articles on your site have also been helpful regarding some of the emerging technologies and questions around solar power – such as micro-inverters, hybrid battery systems, cost-effectiveness, pay-back times etc. Thanks for providing a service that has been so useful. Keep it going as long as you can! Once again I can’t thank you enough. You all have been so helpful when trying to choose a solar system. Thanks again for everything. I’ve told 3 of my mates to check your website out coz they are interested in solar. Many thanks for your superb web site. If you hadn’t been able to provide basic answers to technical questions we would not have been able to proceed. Our installer has been a credit to your system of providing local company names for bona fide operations and everything has worked out perfectly. Thanks Robert – You guys are brilliant! Thanks so much for your prompt and very helpful opinion. I have found the whole experience of liaising with you and Finn very professional and valuable. I certainly like the website – some great links and wonderful information. Thanks for the website and all the hard work thats gone into it – terrific, informative and no nonsense. Thanks very much for your site. It’s fantastic. In the midst of a renovation, it really helped my partner and me to gain some sort of understanding and overview of solar panels. It saved us an enormous amount of time, and helped us make a layperson’s decision with a bit of confidence. Thanks again, I’ll be spreading the word. Thank you for your email – we got the three quotes and have subsequently gone with one of the providers that you recommended – thank you for getting us in touch and connected to these suppliers all of them were great particularly CSA (we didn’t choose them but found their response time and customer service outstanding) – you provide a great service and its so easy and hassle free. Thats wonderful thanks so much. Thank you for all the helpful information on your website too it really helped us know what we needed, what to look out for in a system and the questions to ask the companies. This is a brilliant website providing excellent contacts and a follow up email is just unbelievable. We’d also like to thank you for your SolarQuotes site. The information you provided was invaluable to us – left us well armed with questions and considerably more knowledge than we’d had previously. That information, along with some Google searching, has allowed us to make an informed (we hope) choice, and one that was not based on cost alone. I really must complement you on the web site, it is extremely informative. The reviews are quite extensive, you appeared to have covered all of the suppliers & installers. Most impressive. First and foremost thank you for your wonderful sight and all the information that you have put on it and the time that you have invested in it. It is greatly appreciated and we will recommend your website in the future. By the way, the Solar Quotes web page has been a wealth of down to earth information and has made our search for something worth our money much easier. Well done to Finn and yourself for getting the information out there. Thanks so much for providing this service!! I look forward to the responses/quotes. Many thanks for all your help. I was a lost sheep in a field of wolves without your help. Thank you Finn. 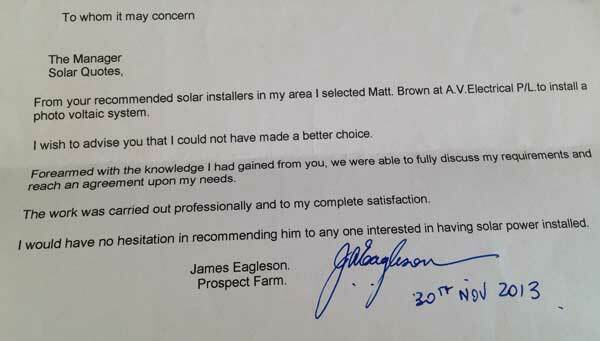 I confirm that I have had feedback from at least 3 suppliers of solar systems. I am very happy with the information that they have provided me and I will study them in the coming weeks and raise any questions I have with them. I appreciate your service and the evaluation sheet to help me to compare quotes. I have encountered only hassle-free politeness and helpfulness the whole way. That matters a lot to me. Your website is very helpful indeed when researching the minefield of solar installation. I learned more from SolarQuotes than from any other website. I feel that I’ve got a better understanding of what’s needed and questions to ask of installers when we eventually revisit our solar plans. And how to fend off the “cowboys” that land on my doorstep. Thank you for providing a very informative site. You guys are fantastic. Not only incredibly prompt and efficient but the information is easy to read and best of all I feel it is independent. Thank you for your wonderful website, without which I would be flying blind. I am now armed with the right questions to get the info I need. Keep up the great work. What a brilliant, impressive web site. Big accolades from me for cutting through all the hurdles for potential solar installers. I’ve ‘been meaning to get solar quotes’ for too long, but also wanting to be on top of technical and promotional info. Solar quotes is problem solved. Many thanks. All quotes are underway. Your website is so informative. Solar is such a huge subject to come to grips with so all your tips and explanations are greatly received. What a fantastic service you offer the novice. Keep up the sensational work. None of this would have been possible without the enormous assistance of your brilliant website. From both myself, and my wife, a huge ‘thank you’,in guiding us on the correct path for our solar future. Solar Quotes has truly been a revelation,and we both thank you sincerely !! I have all 3 quotes and finished my analysis. Site visits went smoothly and felt very confident discussing the details, all thanks to you and your site, the whole research thing was something of a minefield before I found solar quotes. I must say, I have found your website very helpful in the process, particularly with helping me understand the products available out there and the package I should be looking at to meet my needs. Great work by you and your team. It’s great to see a bit of a watch dog on the job to keep the mugs out of the industry. Your website is great! Lot’s of educational information and provided in an independent way – well done! I just want to say thank you for putting together the Solar Quote website. It is an amazing resource that just led me through the whole process very clearly and succinctly. The links to different blogs, websites and policy information was extremely helpful. I learnt so much more about the technical side to solar, then i ever thought i would (or wanted to! ), but in the end very glad that i did, because i can now conceptualise (very basically) how my system will work, what the various options are, as well as common traps/scams. It really is an essential tool kit for anyone about to embark on their solar journey. I’ve emailed your link to a couple of friends who are also trying to navigate their way through all the companies and products out there. I hope it will help them as much as it has helped me. Thanks again Finn. Love your website, its great for ‘Solar for Dummies’ I would recommend it to all. Please keep up the good work. Just a quick note to say thank you for all the help you gave and your site which for novices is very informative. I must say Finn that I was extremely impressed with your website and the valuable information you provide on it. I have wanted to do this for the last couple of years so I had already done some research and had questions of my own…but your site gave me heaps more. Thank you so much for all the hard work you have put into that. It was a real help to me. I found your information very helpful in providing the confidence to go ahead with the installation. Thank you Finn for providing the spring board into the world of solar energy and assisting in unravelling its mysteries. Much appreciated! Thanks a lot Robert. That really helps.You guys are doing a great service in educating the people. I think your website is fantastic. It really helped me (a newbie beginner) to understand what is what, what goes where, what to get and what to avoid. Thank you so much for making a terrific resource for a controversial subject. With much appreciation & regards. Your providing an invaluable service to confused consumers about a complex technical subject. Much Appreciated! Please accept my gratitude for your help in this endeavour. I had been doing a lot of ‘digging up’ and it is really daunting to know which mobs you really can rely on. Everyone claims to be the BEST! Also, I like your humor and ‘cheekiness’. But beyond that, I can sense your sincerity. Cheers and more power to you! Yes, thank you, they all came through over a series of days. Can’t recall the order of arrival. Your whole site is extremely useful & when I talk to people about solar I will certainly direct them to your pages. My thanks for making clear some of the pitfalls & smart things to ask. Finn, I have to thank you for this site of yours. Being far from a tech head, I found the task facing me almost overwhelming. Your well explained articles and clips, with lashes of humour, made it far easier. Thanks Finn. Love your website, very informative which has saved me considerable time in understanding the benefits and potential issues with Solar Energy systems. Thanks mate! This is brilliant! Finally I have a way forward. It seemed the best of the options, but I just wasnt confident enough to go ahead. Really appreciate your research and expertise, and quick response. You guys are a great help! Thank you for your message, and thank you for your website that provides invaluable information that makes it easier to find one’s way through Solar power. Thank you Finn. Your whole SolarQuote system is amazingly helpful. I’ve found the information on your site and the services you offer invaluable in assisting me with my solar choice. I will recommend you to friends with confidence. I wanted to provide some feedback for you as I have found your website and service invaluable to our decision making process. We could not have done this without you. l would like to say that your site is a blessing and l only wish l stumbled across it a few months ago as it would have saved me countless hours in emails,phone calls etc. A lot of family and friends are watching what l do with interest and l will endeavour to sing your praises and pass on your fabulous site to all whom ask. A huge thank you goes out to you, for the information you provide in a no Bull S*** fashion, great work, keep it up. I believe that you are a wealth of information that you share with Australia and beyond with your web site. Which is frequently where i go to to find the latest information in the world of solar power. I wish you all the best and will continue to recommend your website to anyone considering solar power. Finn, love your website and support, your summary PDF is excellent, all 3 co’s were top notch. This was a great way to immediately get quotes without having to contact each person individually – thank you! Can I say how delighted we are to find your website and what a great and valuable service you offer in all respects. I thank you for all the help SolarQuotes has given me as I knew nothing about Solar, let alone what was required, what was best on the market, your site has armed me with the knowledge I need to make an intelligent investment on products and install companies. Thank you so very much. Thank you for the message regarding the Solar Quotes, I appreciate all your help and information that I have received from you, and im very happy with all responses from the 3 listings of businesses given. You have a great set up on this website and I will be recommending it too other people. I have found a Solar Specialist and will be having my Solar System installed over the next coming weeks….. Cheers for all your help and thanks for your excellent website, blog, and service. We didn’t get our quotes through SolarQuotes, but we did make heavy use of the information on the site in choosing a system and a supplier. We wanted to let you know how impressed we were with the SolarQuotes site and the range of useful information on the site – a must-visit site for anyone researching solar power options. Congratulations for setting up and maintaining such a useful source of consumer information on solar PV systems and installers, and keep up the good work. Thank you very much for the extra information. It does put our mind at rest especially now that we have signed up. Your advice has been invaluable to us. Your website has been invaluable during this daunting process, and I’d like to thank you for the information you have shared. I got really impressed with the videos on the Youtube for Honest help and proper guide. Heaps of Stars (***********) for you. Your website is the best thing since sliced bread and I keep recommending it to everyone I talk to about Solar systems. Keep up the great work! Thanks so much. All of you have been so professional & efficient. Well done guys! Your information was pure gold and so useful. I really appreciated it and it helped me make the final decision. Its been great. All have been very useful and given me quick timely contacts… website was a big help, much appreciated, referring all my friends to you. We did move forward with a solar install, greatly helped with your assistance. Much appreciated!!! We could not have moved forward with out your assistance. Thanks you so much for putting us onto professionals. I love your webpage, it has everything I needed in the one place, it has provided me with invaluable insight and helped direct me in choosing the right system for my house. I have to tell you I am extremely grateful to your website. I found it very informative, easily understood and I like the touch of humour you bring to the whole complex subject. I continually referred back to it whenever I had a new query and always found an answer. A quick email to express my delight in using your excellent service. All three quotes were competitive and delivered after a thorough inspection of our site. I was impressed by the professionalism of all three. I was very pleased that they were engineering led, rather than sales orientated. All best wishes for the continuance of your most helpful service. You have a nice and informative website. I knew next to nothing about solar power when I got approached by a company last week to install one in my small house “for free” with 5-year lease that would be paid by “savings”. Reading your website made me realise there is more to ordering a solar system than accepting a quote without any details. Good luck in your efforts to advance the use of alternative energy sources in Australia. Just wishing to advise that as a result of a very professional presentation this afternoon by the rep from The Mark Group we have placed an order with that company for a 3.5kw system. The presentation was good and in line with information gleaned by myself from your site; the price was right, and the products offered were acceptable. The rep was somewhat impressed by the level of knowledge that I had of solar energy systems, and I give full credit to your company for making that available. Overall, it was a quite seamless transaction. I really can’t see how anyone contemplating the purchase of a solar energy system can do so without referring to your site first. I would like to thank you for the support that you provided and give you feedback. Your website assisted me with a greater understanding and lead me to conduct further research and evaluation and finally choosing the panels and inverter and installer. Thanks for your site and as many others have said, it is a very helpful and useful site that helps people to get a better understanding of solar power and some of the issues that must be confronted when considering a system. Cheers and thanks for your excellent website. I have sent it to my mates who need to look into this! I love this site – It has provided so much information to me to help me make an informed decision about installing solar panels. Thank you for your service. You saved me a lot of time, and took away the hard work of finding a supplier who could best match my requirements. Well done! The suppliers you referred are exactly what I want; they got in touch promptly, and they are very professional. Just wanted to congratulate you on a fantastic site. We are considering solar for our home and yes, like most other consumers, we have found the whole decision making process somewhat daunting. However, after coming across your site, and the host of invaluable info contained within we now feel that we are armed with enough information to launch a new assault on our friendly solar providers. God help them! Well done and keep on keeping on. You have undoubtedly rescued many a poor soul from a very distressful decision making process. Thanks heaps for the service you provide. Your website is extremely helpful. Thanks for setting up such an informative and useful site. I referred to it frequently when evaluating my solar options. I just want to thank you for your wealth of information, delivered and explained so beautifully for the non tech-heads like me! I have read through most of your guidelines and have copied off the questions, so hopefully I will be a bit prepared. Thanks so much for your website. It is fantastic & I have learnt a bundle! You,ve got an interesting website & approach to the confusion that is getting solar power quotes for homes, It’s been really helpul to be able to go thru your blogs & list of questions to get a handle on the differences out there. Well done keep up the great work. I hope it’s paying off for you. I had the 3 quotes pretty quick. They rang before you emailed, and arranged an appointment straight away. I’d also like to thank you for making this service available. I knew I wanted solar but I didn’t know much about it or how to go about getting info, then I found your site and I must say I found it really really helpful. I like the info, the way you write it and the videos, though maybe it helps that being English I also have a built-in affinity for the humour 🙂 I read your Long Story too, so congratulations on being one of the few people who have a) had the aha moment and more importantly b) then done something personally about climate change. It’s a good story and I am already telling others. As for your website as well as Robert, what can I say. I wouldn’t even have gotten so far without all the information & assistance from you guys. Let me start by thanking you for the great service you offer. The supplied leads were top class, and the service providers were professional. The vendor questions provided to be extremely helpful and most definitely guided our process. You are out of this world to go to so much trouble for me, I am so grateful for your fabulous assistance and it is people like yourself who seem to be a dying breed that help one to keep faith in human nature. You offer a wonderful service. Congratulations on the work you are doing to improve the integrity of the Solar installation business, a very important contribution to the industry. I have never seen such an unbiased, easy to read, complexity reducing, series of simple explanations for such a complicated topic. Your site is excellent. I look forward to the quotes. You have debunked myths, aggregated industry knowledge and streamlined it, sorted wheat from chaff or in this case mono from thin. You have done it with wit and candour and you have done it objectively. I just wanted to say a big thank you for a really useful resource in clearing up a lot of the confusion in my brain about the world of solar. The quotes I obtained through your website were really useful in guiding my thinking. Can’t thank you enough for your very informative website and service, knowing all the right questions to ask has made the process so much easier. And I feel much better educated about the whole subject of solar, and confident of making the best informed decision. The world is truly a better place for people like you. Your time and effort regarding your website is brilliant, and most helpful in picking out the salesmen to the person who truly has your best interest at heart. Keep up the great work Finn you’re awesome! Thank you for your follow up and the ease with which your website makes the whole procedure. Thanks a lot for the incredible knowledge and information I have gained by going through your solar energy site. I strongly advise anyone that is thinking of installing solar panels to read through your knowledge base before picking up the phone or even attempting to make any decision. Great to have a website like yours where I have picked up lots of tips and info. I would also like to add that your site has been invaluable and we may not have even started this venture without your information. Independent opinions from someone with the knowledge and experience is essential when embarking on something like this. Thanks for providing a great service. We were floundering around, having had NO experience with solar up to this point. You made it a quick and painless process. You’ll receive my recommendations to friends any time. Also of great importance was your site in explaining all the pros and cons of solar. While I am not an expert it all helped have some understanding that gave me the knowledge and confidence to proceed with the technology and I think I asked some clever questions ( even if I pinched the questions from you). But seriously thank you , you have provided education and sound knowledge and this is appreciated. The quoting service we received via the Solar Quotes referrals was handled highly professionally and most helpfully by the companies that we consulted. Sales staff were top notch in both cases and the final decision came back to one of price. Even then there wasn’t much between them. Madison completed installation today without any fuss or difficulties and the system is working, subject to meter updating by SA Power Networks. We’ve been very impressed from start to finish and wouldn’t hesitate to recommend both the process and the companies involved. Love your website, it is the best one I’ve seen in a long time, so much info…truly amazing thank you. You’re a star Finn! I love your site, by far the most useful site dealing with solar power I’ve seen! I would like to thank you for your web site. I knew nothing about solar panels. It helped me navigate the mine field of buying them. It assisted me in asking the relevant questions, and in the end I felt that I had made an informed decision. Hi Finn thanks for informing us consumers about all the need to know stuff on -solar panels-inverters-good guys installers -up to date info on solar technology -the lot. I’m one of those not computer literate folks and didn’t use the net until 2013 so I didn’t know about your good self and your good works. Having read the honest truth regarding what one needs to know about buying a solar panel system I wish I could go back to 2009 and get 3 free quotes from reputable installers on your website.Thank you for documenting on your site how you started your business – the short and long story-indeed you are the fair dinkum real deal -I takes me hat off to ya. Thank you for your help, your site helped me immensely. I researched my solar products and had decided on the brands. I highly recommend your site, as the guidance provided allowed me to contact a dealer/installer I was not previously aware. Definately a good resource to anyone researching solar installation. Thank you so much for it being so helpful and informative. And cutting through the BS. Makes buying a solar system that much easier. Yes, a long time after we got our 3 quotes I did get solar panels installed, in June 2013, just in time to get the feed in tariff. Your website made the research so much easier. Being able to get information and check other people’s reviews was so much help. I am very happy with both SolarQuotes.com.au and Go Solar Power. In fact yesterday a relative rang up knowing that I had installed solar panels and I have given them your website’s name. Thanks for all the wonderful info you provide on your site. You’ve certainly made it relatively easy for me to both understand solar power and to be able to ask intelligent questions from the various providers. Without the information provided on your site I would have been very confused by the different quotes but I feel I have been able to choose a system that will be best for us long term. Thank you for following up. Yes I have received 3 quotes thank you. Your web site is the most helpful site I have come across regarding decision-making for solar panels. It allowed me to make a rational factually based decision on the size and type of system for my needs. I have received two of the three quotes (from Madison and Nicholls Group). I have made a decision to buy a 6Kw system from Madison. Thankyou for providing such a valuable website and arranging the quotes. Your website makes it much simpler to understand all the tricks and traps of solar power and gives novices like me a much better understanding of what is being offered by all the solar power companies out there. I just completed your survey, but I wanted to write and thank you for your website. I’m a very analytical person and it really helped me wade through the mountains of solar information online and make what I think was the correct decision for my solar system. Thanks again, and keep fighting the good fight. This is an amazing service. I’ve been dithering about installing solar for more than 3 years. I feel confident to go ahead with the installation now. Many thanks for your service and for the extensive information and commentary you provide via your web site. This has been extremely valuable in being able to make sense of a fairly complex process. Without such info’ we would be hard pressed to make sense of the myriad of options available. Thank you for your Solar Quotes website. I found it invaluable in sorting out the basics of solar power and then having three companies to ask for quotes meant I felt much more confident in going ahead with installing solar panels. Your hints, tables and charts for all aspects of the process were very helpful. We are yet to be connected to our retailer, though I believe it will be done in the next few days. Altogether it has been a very smooth process.